MASONRY HEATERS: Designing, Building, and Living With a Piece of the Sun: Is This a Masonry Heater? If you visit websites in the United States and Canada for masonry heaters, you are almost guaranteed to find a picture of a Finnish contraflow masonry heater. These are characterized by their tall, upright appearance. Often, they are around seven feet tall. The body of the heater is primarily symmetrical. The loading door and bakeoven door (if equipped) is centered on the mass. For many people, this is a very pleasing appearance. Many people love symmetry. 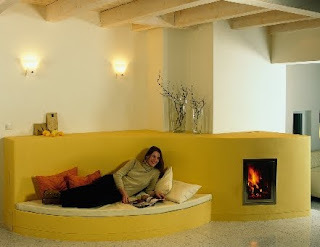 The Finnish contraflow also has some resemblance to what is commonly thought of as a fireplace in North America. However, all masonry heaters are not Finnish contraflows. What's more, Finnish contraflows lack some versatility. Note the above picture. Yes, it is a masonry heater. But there definitely nothiing symmetrical about it! Nor is it at all upright. This demonstrates the unique quality of versatility truly available in the masonry heater world. The picture itself is from the website of Creatherm (www.creatherm.de/). I encourage readers to take a look at this website and browse the gallery. You will begin to really appreciate the wide range of possiblities in masonry heaters.